Speed and efficiency is something you look for in a cutter? The Duplo CC-330 Card Cutter can process sheet size of up to 13" x 19" and cut up to 240 business cards per minute. It features seven preprogrammed tasks and with the possibility to program six additional jobs, creating a wide range of functions for multiple projects. With a cut mark sensor located on the top and bottom, image shift are in the past. Accuracy cutting starts from the beginning till the end of the job. A waste bin, hidden from the eye, provides a clean and safe working environment. The compact and versatile CC-330 provides the unnecessary labor and increase the efficiency to any office size. Paper Sizes: Letter, Legal, Ledger, 12" X 18", 13" X 19"
Dimensions (L x W x H): 20" X 22" X 40"
Standard: Slitter Cassette For 12" X 18"
The CC-330 produces up to 240 business cards per minute and can handle larger sheet sizes up to 13" x 19". Job setup is easy. Simply load the paper and adjust the guides. Optional conveyor with adjustable rollers can be added for neat stacking. Easily select a preprogrammed job on the control panel, press Enter then Start. The CC-330 comes standard with a stand and waste bin compartment. Easily interchangeable, optional cassettes for different applications are available upon request. Finish full-bleed applications such as 2-up 8.5" x 11" brochures or 4-up 6" x 9" postcards. Does it come with the standard cassett? Thank you for your question. 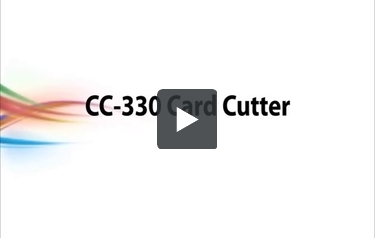 The Duplo CC-330 Card Cutter is available in a variety of set ups. When you select the desired option from the drop down menu on the product page it will automatically adjust the cost to match the selected features. Can the business card module cut 160# cover. Are the slitters resharpenable? Thank you for your question. The CC330 accepts a wide range of paper stocks up to 110 lb. cover/300 gsm so this will not work with a 160lb cover. The blades cannot be sharpened, however, the can be replaced. We run mostly 130# Pro Digital Gloss. That would be the heaviest we would be running. Would there be a problem with that stock? Thank you for your question. 130 # stock is at the upper limits of what this machine is able to cut. When cutting that weight of stock it would be advisable to cut a little less at a time to help prolong the longevity of the blade and the machine. Depending on how glossy your stock is you may also need to slow down the feed mechanism of the unit in order to prevent the feed rollers from slipping as the stock is fed into the machine. I need to slit 13 x 19 sheet, 24 up 2 x 3.5 cards. I see where it comes with a slitter standard but it says 12 x 18. Can this machine cut this size standard? Thank you for your question. The Duplo CC-330 Card Cutter is able to process several sizes of stock including letter, legal, ledger, 12" x 18", 13" x 19" sized sheets. Can this handle 100lb gloss? Assuming here that you are talking about 100lb cover and not book. However, either way this unit should be able to feed and cut these stocks to make cards. However, depending on how glossy your stock is you may need to slow down the feed mechanism of the unit in order to prevent the feed rollers from slipping as the cards are fed through the system.